It’s the time of year when upscale retail sites rather self-consciously trot out their Halloween collections. I generally don’t give them much thought, since I figure if you want to spend 300 bucks on a wall hanging that’s your own business. Occasionally, though, I’ll run across something where the the price is so outrageous, where a DIY version would be so simple, that it just makes me wince. The Beaded Pumpkins from Horchow are such an item. These are resin pumpkins with beads glued on. They are $195 + shipping. Apparently P.T. Barnum was misquoted because it is clear that what he actually said was, “There’s a sucker born every minute, and then they go buy pumpkins at Horchow.” Ye gods. 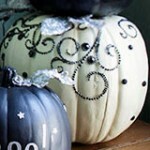 If desired, paint the pumpkin–use something that won’t melt foam–and let dry. Use a pencil to very lightly sketch your desired design onto the pumpkin; you should be able to erase mistakes without much trouble. Glue rhinestones, crystals, or other flat-backed beads over the pencil lines. You can often find self-stick rhinestones that already have adhesive, but you can also use a hot glue gun or a good-quality glue like Gorilla Glue. Let dry. Lie to visitors about how much your gorgeous pumpkin decorations cost. Attractive, easy, and at a tiny fraction of the cost of the commercial ones.